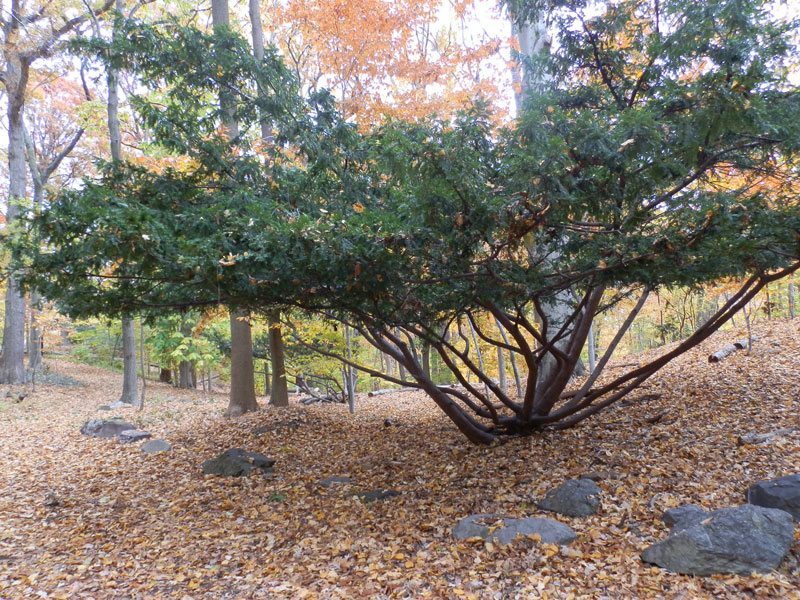 Over the past several decades, the woodlands of the Cora Hartshorn Arboretum (CHA), like many stands of Eastern deciduous forest, have been severely degraded and have lost a healthy understory of native tree seedlings, shrubs, and native herbaceous plants. Human intervention, in the form of overdevelopment, has led to a reduction of forest habitat in our geographic area, an overabundance of white-tailed deer, and an ecosystem that is suffering from a loss of biological diversity. In some areas of the CHA woodlands the void created by deer browsing became filled with non-native invasive plant species that are unpalatable to deer, and incapable of supporting desirable native animal species. In many cases these invasive plant species are the offspring of non-native shrubs, trees, and vines which have been planted in nearby residential properties for their ornamental value, but which have proved to be invasive in woodland settings. By 2000, some areas of the CHA woodlands had no understory at all, just a barren forest floor. Those areas had been occupied by large populations of Norway Maples, a tree species that had been imported from Europe in the 18th century for its value as a shade tree, but which had devastating effects on woodland habitats since almost no other plants, native or alien, can grow or regenerate under its dense leaf canopy or among its shallow extensive root system. By the late 1990’s the Arboretum’s Board of Trustees realized that without human intervention, the Arboretum’s 16 acres of woodlands would be incapable of regeneration. When the mature native trees in the woodlands succumbed to old age or disease, what would remain would be an environment that could not support many native species of birds, insects, mammals, amphibians, and reptiles that should call the woodlands home. This certainly was not the legacy envisioned by Cora Hartshorn. Beginning in 2000 the Board of Trustees raised funds to commission several studies of the woodlands that have been used as a road map in our restoration efforts. 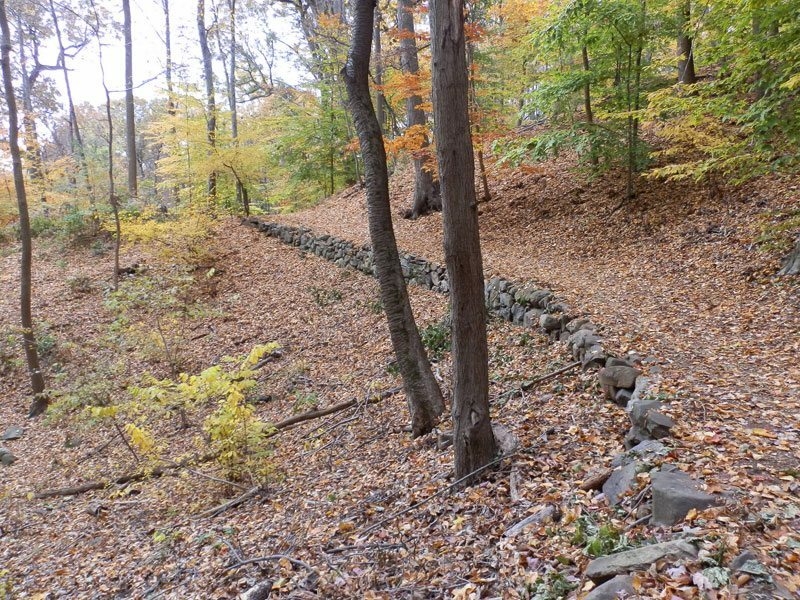 Those studies were supplemented by the Forest Management Plan for the Arboretum created by the Millburn Township Forester in 2007 and a township wide Invasive Species Management Plan commissioned by Millburn Township in 2008. All of the studies recommended the construction of deer fencing to protect existing native plant species and to allow the regeneration of native tree and understory species. A few test acres were fenced in 2002, and after seeing encouraging regeneration of wildflowers and native Spicebush and native tree seedlings within the fenced areas, the Board of Trustees, with the support of Millburn Township, decided to fence the entire 16 acres in 2008. Beginning in 2002 a concerted effort was made to remove all the seed bearing populations of Norway Maple from the Arboretum’s woodlands. We have begun replanting native plant species in areas cleared of Norway Maples in an effort to jumpstart the natural regeneration of native species and to prevent the spread of non-native invasive species into areas opened up to sunlight. We make an effort to select plant species that have a high value for supporting native insects and birds and that are relatively maintenance free. We still have many populations of invasive plant species in the woodlands and our volunteers work continually to keep those populations under control, and where possible, eradicate them. Because most invasive species of plants are spread by birds and wind dispersal of seed, we will have to be continually vigilant to prevent their spread in the Arboretum. We will also have to monitor the woodlands for evidence of invasive insect and pathogen species, such as the Emerald Ash Borer and many tree diseases. On a historical note, it was a non-native fungus-the Chestnut Blight that killed the many native chestnuts that grew in the woodlands before Cora Hartshorn acquired the land.